I’d love to have one of those Nixie Tube Wang 360’s (page 3) on my desk. AS RECENTLY AS 15 YEARS AGO, ACCORDing to the American Federation of Information Processing Societies (AFIPS), there were fewer than 25 computers at work in all of the US. That number has grown today to well over 35,000, and the AFIPS predicts that by 1975 there will be more than 85,000â€” representing an annual investment of $30 billion. Understandably, the greatest increaseâ€”because of their lower initial costâ€”will come in the area of compact and desk-type computers. Though physically small, many of this new generation of time-savers are capable of a wider range of computations than some of the huge multi-rack installations of a decade or so ago. Strictly speaking, the subject of this article is a hybrid. An electromechanical calculator, or adding machine, can perform only simple operations. A true computer has large-capacity memory banks and can be programed, or instructed, to “learn” a long and intricate series of computations. A desk-top computer can do more than an adding machine but less than a true computer. It is becoming a popular item with many businesses, and will be used so much in the future it will open many job opportunities. Electronics technicians will be needed to service these computers. In all but a few isolated instances, factory-service opportunities include extensive training programs for technicians with a good technical background. Factory-trained technicians service and repair computer hardware directly for the factory or for local franchised distributors of the equipment. Although service during warranty will be performed by the factory or by its authorized distributors, most manufacturers later will encourage in-plant electronics personnel to perform all routine computer maintenance. Service information and short training courses will be made available to the personnel of qualified plants. Many users obviously will have to add technicians to their existing staffs when complex computer equipment becomes a significant part of the company’s office equipment. Manufacturers of desk-top computers agree, however, that independent industrial-service organizations will be unable to enter the field of desk-top computers. Few, indeed, would want to. Sales and service functions of this magnitude are best performed under factory direction. Service information, therefore, seldom will be available to independents. It’s hard to generalize about what talents and training are required for-fac-tory-service work. Each manufacturer has his own employment standards. Very few require applicants to hold degrees for field and shop workâ€”high school and an interest in electronics generally are minimum requirements. Technical-school graduates should have no trouble being accepted as trainees in any manufacturer’s sales and service department. Experience in office-machine servicing is most desirable, but an electronics technician with this type of background is rare indeed. The market is wide open, and most companies are expanding their sales and service staffs for the time when their electronic calculators become part of every corporation’s office-machine budget. 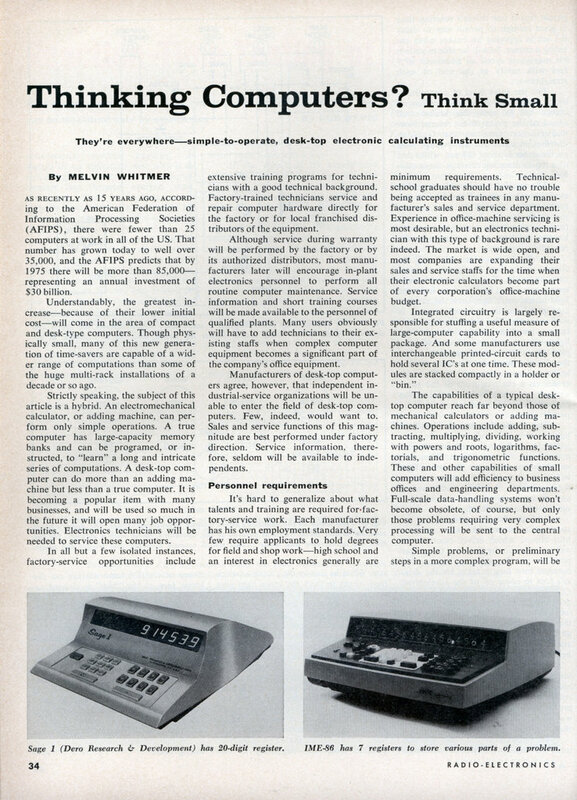 The capabilities of a typical desktop computer reach far beyond those of mechanical calculators or adding machines. Operations include adding, subtracting, multiplying, dividing, working with powers and roots, logarithms, factorials, and trigonometric functions. These and other capabilities of small computers will add efficiency to business offices and engineering departments. Full-scale data-handling systems won’t become obsolete, of course, but only those problems requiring very complex processing will be sent to the central computer. Simple problems, or preliminary steps in a more complex program, will be accomplished with the desk-top computer. This elimination of trivial tasks will greatly increase the usefulness of the central computer. Since operating a small computer is similar to operating a mechanical calculator, it’s a job easily assigned to non-technically trained employees. An integrated circuit deposited and etched on a chip of silicon or other semiconductor material performs the same function as a conventional multicompo-nent stage. Resistors, diodes, capacitors and transistors that normally would be used to build a typical transistorized stage are replaced by small areas of deposited metallic oxides. The circuit shown in Fig. 1-a is the equivalent of that constructed on a single integrated-circuit chip. In operation the circuit establishes two stable conditions: The first occurs when Q1 and Q2 are conducting; the second, when Q3 and Q4 are conducting. Input pulses are applied to Sc or Rc . Clock pulsesâ€”which synchronize the advance of data through the computerâ€”are applied at connector C. Outputs are obtained from Rd, Q, Sd, or Q and differ primarily in current-output characteristics. Outputs Rd and Sd vary about 1.5 volts, based upon the stable condition. Outputs Q and Q vary about 3.5 volts, at a higher impedance than that available at Rd and Sd. If a set pulse is applied to Rc, then Ql and Q2 are driven into conduction by resultant decrease in base current for Q3 and Q4. The first input pulse at Sc reverses the stable state, cutting off Ql and Q2 and driving Q3 and Q4 into conduction. A clock pulse will then produce outputs (negative pulses) at Sd and Q.
Microelectronic circuits formed in metal-oxide-semiconductor (MOS) chips often replace as many as 200 standard components; a complete 10-digit counter, for example, can be built into an MOS chip. This greatly reduces the size of the computer without sacrificing problem-solving ability. Servicing MOS circuitry requires some understanding of the computer layout, a visual inspection for open or shorted printed-circuit paths, voltage tests and finally, replacement of the defective unit. Most computer manufacturers use some form of modular design to facilitate plug-in repairs. The defective plug-in board module may then be returned to the manufacturer’s central-repair station for detailed analysis and for repair, when that is possible. Alternatively, the digits may appear on Nixie tubes or a CRT. The block diagram of a typical small computer is shown in Fig. 2. Keyboard output is fed to the control unit. From the control unit, input data pass to the “learn” or storage sections. The mathematic unit may accept data from the storage register or from the keyboard input (through control unit). Steps, operators and solutions are fed to the printer control circuits, then imprinted on the tape. A computer like this may “learn” 24 or 48 steps, depending upon the model selected, and there are eight storage registers. The learn feature is the next best thing in computer capability to a completely stored program. Several steps can be stored in a program memory when a problem is repetitive. Working with progressions (1, 7, 13, 19,.etc.) and factorials (17 x 16 x 15 xâ€”etc.) could be tedious if done manually. The program memory learns a few basic steps and the operator then activates an automatic sequence. All categories of computers are achieving a far greater component density through microcircuit techniques. So, the distinction between desk-top and central computers has to be drawn not only on physical size but on capability as well. A desk-top computer is generally considered to be one that requires no formally prepared stored program entered in a special language. Most desktop computers are operated like adding machines or mechanical calculators. Problem information is inserted through a digital keyboard or typewriter in much the same sequence as it would be written by hand. When a special program language is required, the computer is properly called a general-purpose digital computer, even though the keyboard or typewriter can be placed on a desk. Physically, desk-top calculators are either completely self contained or have only a small auxiliary unit that can be mounted under the desk. When the electronic package is built into a desk or con-sole, the computer’s computational capacity is usually so large that some form of preprograming is necessary. 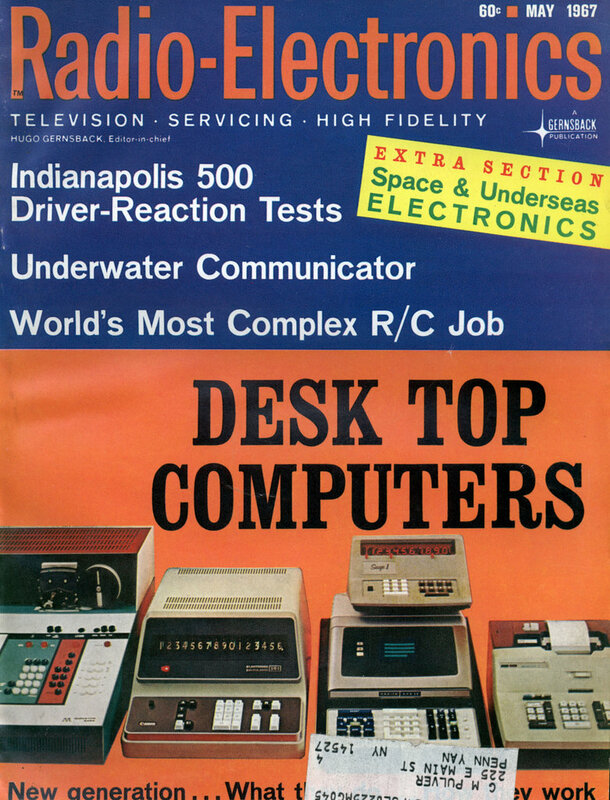 Typewriter, teletype, punched tape or card-reader inputs usually put a computer out of the desk-top class. The exception, of course, would be the addition of one of the above input units to a keyboard-input computer to extend its versatility. Since a desk-top calculator seldom requires a stored program, steps to be performed are entered as the computer works the problem. Most small units have storage registers for holding partial solutions or constants. Thus, solving a problem involves step-by-step progression initiated by the operator. 1. Enter value for Rl. 2. Add value for R2. 3. Store sum in a register. 4. Enter value for R1. 5. Multiply by value for R2. 6. Divide by sum stored in register. The operator takes the place of the program that is normally stored in a big computer. The 10-digit keyboard is used by most manufacturers for data entry, and additional keys select the function to be performed. There seems little doubt that desktop computers will increase in number by the tens of thousands during the next decade. Indeed, some expert observers compare the effect of the “computer revolution” to that of the machine-based technology that sparked and nourished the industrial revolution of the last century. If that is true, and it seems to be, the predictions of the AFIPS may prove to be extremely conservative. In any case, opportunities for technically trained electronics specialists are certain to grow along with the expanding computer technology. Take a good, hard look at a fascinating field. You well might find yourself a part of it.